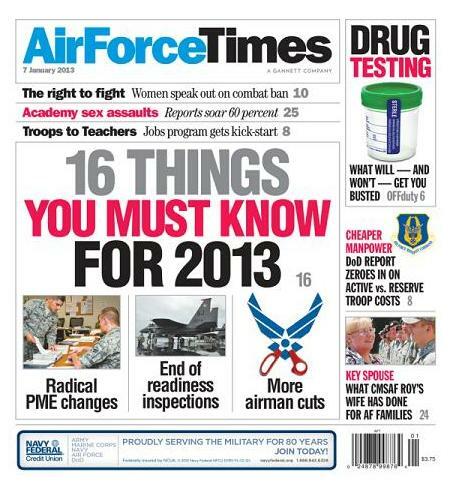 More force cuts, possible mandatory military training instructor duty and new tobacco rules are just some of the issues on the horizon for 2013. You can read more in “16 Things You Must Know for 2013” in this week’s edition. In other news, the Air Force is upgrading the software for its Block 40 and Block 50 F-16 fighters. Air Force Times lets you know what’s most important about these upgrades. Also in this week’s edition: Reports of sexual assaults at the Air Force Academy jumped nearly 60 percent in this past academic year. Officials claim more victims are feeling confident enough report assaults, but the rising figures at all of the service academies indicate that efforts to reduce sexual assaults are not working. And Paula Roy, wife of Chief Master Sergeant of the Air Force James Roy, has made talking to Air Force spouses and hearing their concerns a priority since her husband became the Air Force’s senior enlisted leader in 2009. In this week’s edition, she talks to Air Force Times about her role and what programs she’s been involved with.